The road to Science Hell is paved with good intentions. As I anxiously await my ninth total eclipse of the sun here in Western Kentucky, I was shocked to see that the swimming pool would be closed during the event in the interest of public safety. Is our resort afraid people will lose their way in the darkness and fall in & drown, or has a viral Internet rumor been spreading that looking at an eclipse while immersed in water will cause blindness? Bad science abounds around eclipse time. From people locking children indoors for “protection”, to religious leaders predicting the end of the world is nigh, something about losing the sun for a few minutes brings out the daft among us. 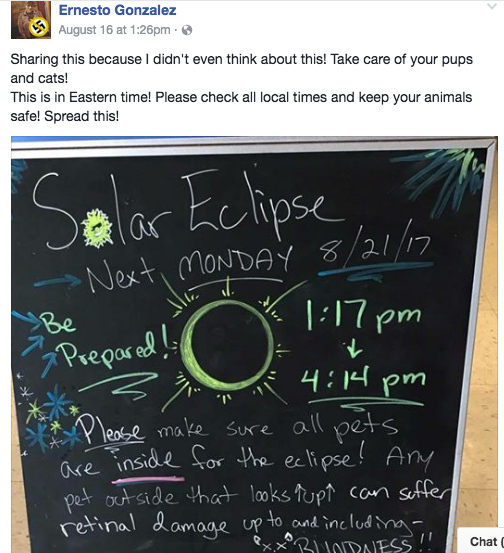 Pets going blind because of the eclipse? No. Just no. If you aren’t in the path of totality, staring at the partially eclipsed sun is going to be just as painful and counterintuitive for your cat/dog/guppy as it would be for you. 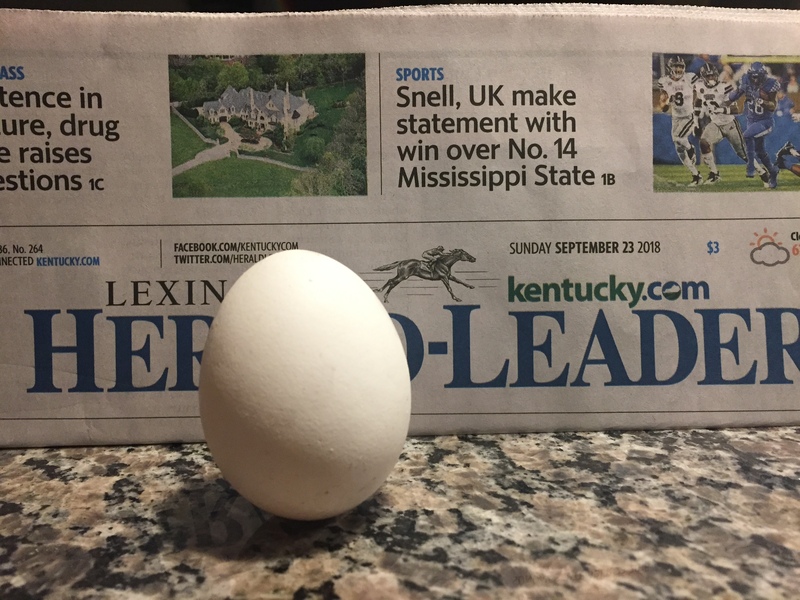 Even with 99% of the sun blocked by the moon, as it will be near my home town of Lexington, KY, the sun will be far too bright to look at with the naked eye. So why, pray tell, would Whiskers and Fido suddenly feel the urge to stare intently at the sun and fry their retinas like bacon? Answer: they won’t. The only odd behavior you might notice from a pet during this eclipse would be if you happen to own a critter that routinely feeds or beds down at sunset. 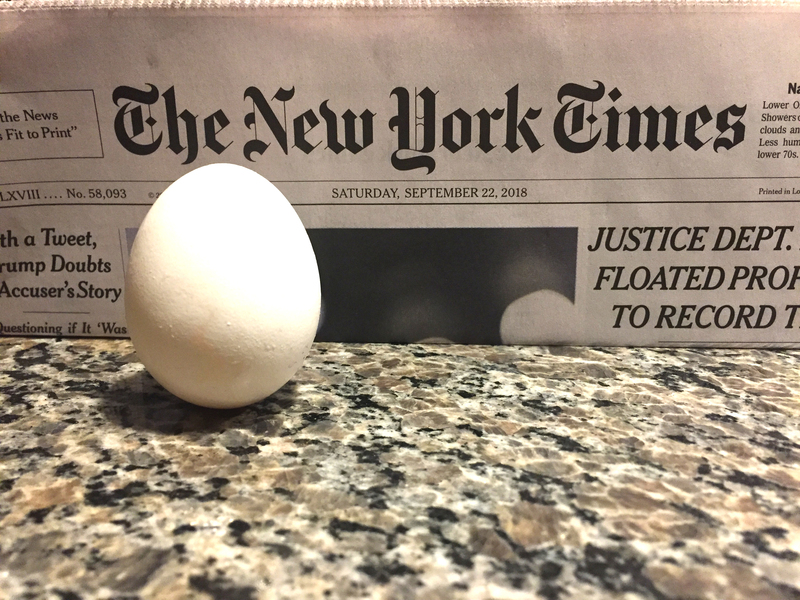 Animals sometimes get tricked into thinking that the eclipse signals nightfall. 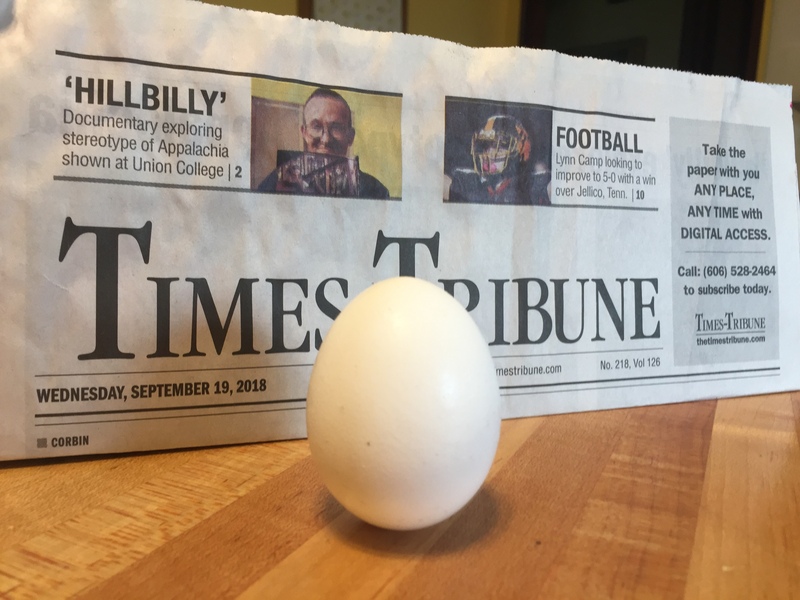 Bessie the Cow might head for the trough, Trigger the Horse might head for the barn, but if you plan on putting either in the house to protect them from the eclipse, you’re wasting your time (and risking severe carpet damage). The only animals who need to worry about protecting their eyes during this eclipse are humans. We know something special is happening, so we tend to do something unnatural and stare at the sun. Proper eye protection is de rigeur in this case during the partial phases of the eclipse. Fido and the other pets will have no clue what’s going on, and will happily go about their business–unless some Facebook addict ruins their day by locking them in the house. With a beautiful total lunar eclipse on slate for Saturday, April 4, old earth creationist John Hagee has resurfaced with revived claims of prophecies in the skies. I wrote about Hagee earlier this year, debunking his claim that a tetrad (series of 4) “blood moons” was a sign from the heavens that something significant was about to happen in Israel. Tragedy knocks on the door of Israel and/or the Jewish people. Miraculous victory is somehow snatched from the jaws of defeat. (1) and (2) are announced in the heavens by a tetrad of “blood moons” (total lunar eclipses) that magically occur during one of two Jewish holy weeks. Hagee’s conclusion: divine intervention in Israel, proven by an invisible hand controlling the positions of the sun, earth, and moon. 1. Holidays on the Hebrew calendar are tied to lunar phases because humans designed the calendar that way. Periodic adjustments are made to the calendar–by humans–to keep seasons (and, as a result, religious holidays) “aligned”. It’s no accident that the sun, moon, and earth are lined up in a certain way on a given Jewish holiday. People constructed the calendar in that manner–and they go to a lot of trouble to keep it from changing, even periodically adding a temporary month to keep the holidays from drifting out of alignment. 2. Major events cited as miraculous by Hagee do not actually coincide with “blood moons”. He apparently never bothered to check an almanac of eclipses. His 1967 “Six Day War” example is a great illustration. Yes, it was triumph from tragedy for Israel. Unfortunately for the good pastor, there was no lunar eclipse on Passover or Sukkot in ’67. Oops. 3. In fact, most major events in Israel’s history don’t occur anywhere near an eclipse. If the heavens are being used as a signalling device, it’s broken most of the time. I offer as evidence the Yom Kippur War of 1973. If ever Israel turned tragedy into triumph, wouldn’t beating off the overwhelming surprise attack in 1973 be a prime example? Where were the holiday eclipses? Answer: there weren’t any. 4. Hagee’s command of history is shaky at best. For example, America wasn’t “discovered” by Columbus as Hagee claims–there were already people living there when the explorer arrived. In any event, he wasn’t the first outsider to arrive in North America. And, while credence could be given to the minister’s claim that the United States became an eventual safe haven for the Jewish people, it certainly didn’t remain that way for the millions of Native Americans who died at the hands of European settlers. And, dare I mention… there was no Passover/Sukkot eclipse in 1492? John Hagee gets it wrong again. Other than the simple truth that eclipses actually happen, John Hagee doesn’t even try to get his story straight. And, for some reason, his followers eat his nonsense up. It’s a shame that an event that’s beautiful and wondrous in its own right has to be linked to superstition and fear, and that those who follow Hagee won’t take the time to fact check him. Lunar eclipse photography by the author. Copyright (c) 2015 Mark Aaron Alsip. All rights reserved. “John Hagee at Podium” from Wiki Commons, by owner Christians United for Israel. Released into public domain by owner. Image owner does not necessarily agree with or endorse the views expressed by the author. “Blood Moon” over Kentucky. Photo by the author. As an avid astronomer, it would be nice to have just one celestial event that wasn’t hijacked by an astrologer, new age mystic, cult, or end-of-days preacher.10,11,12 This time it’s the latter — old earth creationist John Hagee popping up with his twisted interpretation of last November’s “blood moon”, a beautiful lunar eclipse visible from much of the world. Hagee believes that lunar eclipses are tied to major events in the history of Israel and the Jewish calendar. He couldn’t be more wrong. Following is a debunking in simple quote/response format using Hagee’s statements as they appeared in an online article published by CBN.1 Since this is a science blog, I’ll concentrate mainly on the astronomy, but weave in enough history and religion to show just how far the preacher goes in violating his religion’s prohibition against lying. What we’re going to see is that (1) there are no lunar eclipses occurring on most of the dates that Hagee claims, and (2) major events in Israel’s history occurred when there weren’t any eclipses, and (3) events on the Jewish calendar are tied to the lunar cycle because people designed it that way. Response: The paths of the sun and moon are controlled by gravity and inertia, just like all the other bodies in the universe. But even if you grant Hagee the point and say that God created inertia and gravity, there’s still nothing special about a blood moon occurring on a Jewish holiday. Lunar eclipses can only occur during a full moon, when the earth is between the sun and the moon. It’s important to keep this in mind, so I’ll say it again: lunar eclipses (blood moons) can only occur during a certain phase of the moon (full moon). It’s not a coincidence that the moon is in a certain phase when a given Jewish holiday begins–and it’s not a miracle–it’s the only time it can happen. Judaism placed its holidays on a lunar calendar, just as Americans placed the 4th of July holiday on a solar calendar. Compare a list of Jewish holidays to moon phases during 20142,3 and do the same for 20152,3 and 2016,2,3 and you’ll quickly see the connection. Keep in mind that the cited tables list solar calendar dates, but the Jewish holidays are based on a lunar calendar. These different calendars add to the woo factor of Hagee’s miracles. The Jewish holidays keep popping up on different dates on Hagee’s solar calendar and the moon appears to be “chasing” those holiday dates. It’s magic! 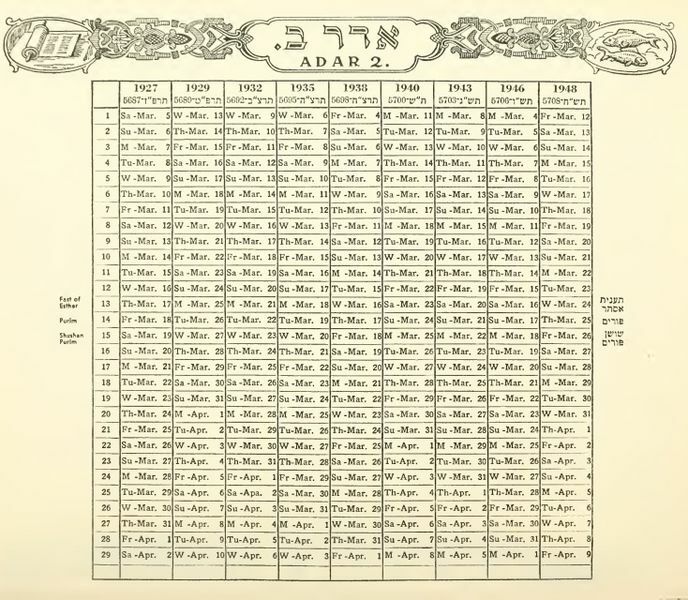 24-year Jewish calendar showing the month Adar II (the month of Adar bumped from its normal spot on the calendar by the leap-year addition Adar I). Click image for large version. There’s a fun twist: it takes the moon a little over 29.5 solar days to orbit the earth, so the Jewish month is about an odd half solar day long. Over time this “error” accumulates and would force holidays to occur out of season as days shift on the calendar. We know the corrective measure as the leap year. Why am I banging away at the details like this? To impress upon the reader just how hard people have worked throughout history to make sure that events such as religious holidays here on earth line up with an event going on up in the sky. There’s an additional twist: in Judaism, days begin at nightfall, not at midnight as they do on the solar calendar. For those of you keeping score at home, tying a calendar to both the moon and sun in ways like this technically makes the Jewish calendar a “lunisolar” calendar. (You’re welcome). But is there an eclipse every full moon? No. 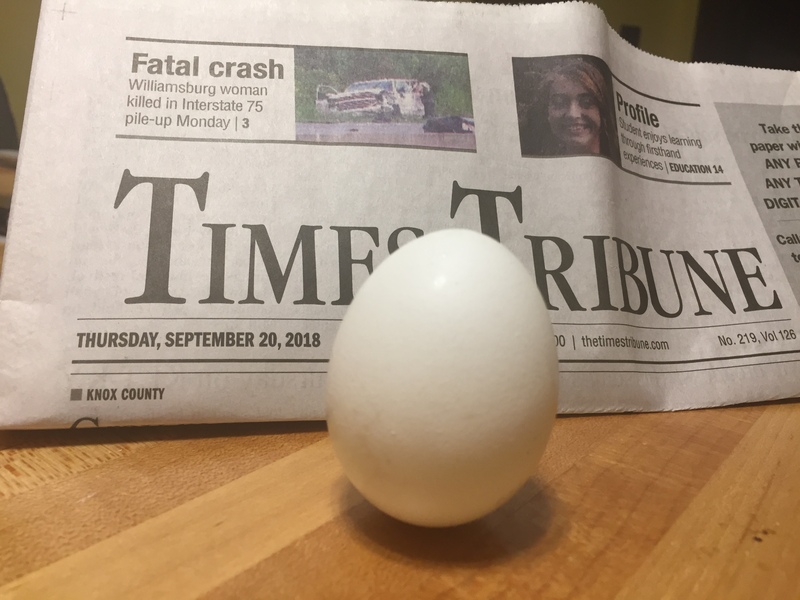 This is because of yet another twist: with respect to the earth’s orbit around the sun (the “ecliptic”), the moon’s orbit forms an angle of approximately 5 degrees. Put more simply, if you drew a line between the middle of the earth to the middle of the sun, the moon would appear to swing “above” or “below” the line by 5 degrees as it orbits. Usually, when the moon is full, it is “above” or “below” our planet’s shadow, and no eclipse occurs. So, given all of this information on Jewish holidays, full moons, and lunar eclipses, we’re finally ready to look at some actual historical events and Hagee’s claims, and see what, if anything, has been happening on certain Jewish holidays. Can we make any prophecies of future events based on what we find? Response: When is something not happening involving Israel that impacts the Middle East and the whole world?13 This is, remember, a country straddling the geographic heart and soul of 3 major world religions. This kind of prophecy is as easy as predicting an earthquake on the San Andreas fault. Can you be more specific please? Israel’s 1948 War. When is something of importance NOT happening here? Click image to enlarge. In the past, the rare appearance of four blood moons on these feast days has coincided with major events for Israel and the Jewish people. In 1492, Spain expelled the Jews. Columbus also discovered America, which became a safe haven for the Jewish people. Wait a minute. I thought events beginning with tragedy and ending in triumph were supposed to be signaled by blood moons? “In 1967, Israel won the Six-Day War and recaptured Jerusalem. “For the first time in 2,000 years, Jerusalem and the State of Israel were together again,” Hagee said. Response: Given Hagee’s horrendous track record in history and predictions, I don’t even want to know what that one thing is. Totality is ending. So is this article. Image by the author. All lunar eclipse photography by the author. Copyright (c) 2014 Mark Aaron Alsip. All rights reserved. “24 year Jewish Calendar for Adar II” from Wiki Commons. This work is in the public domain of the United States because copyright has expired due to publication date prior to January 1, 1923. 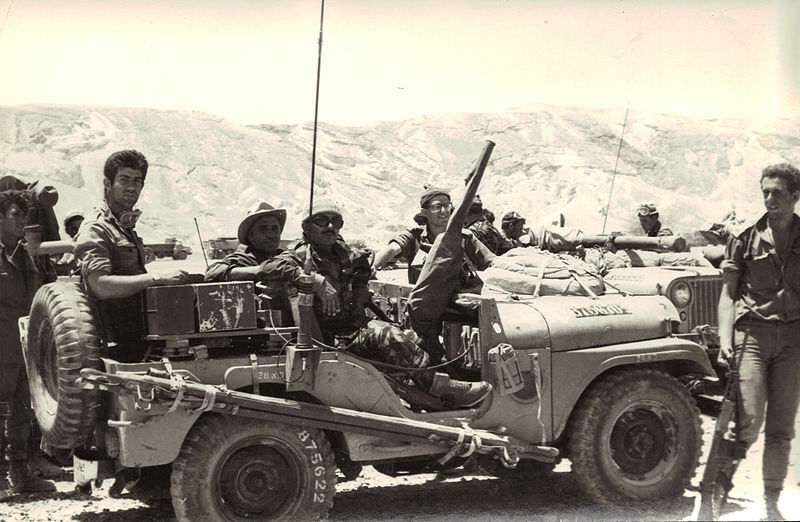 “Israeli Soldiers in 6 Day War” from Wiki Commons. Released into public domain for all use by owner “ROSENMAN424“. Image owner does not necessarily agree with or endorse the views expressed by the author. 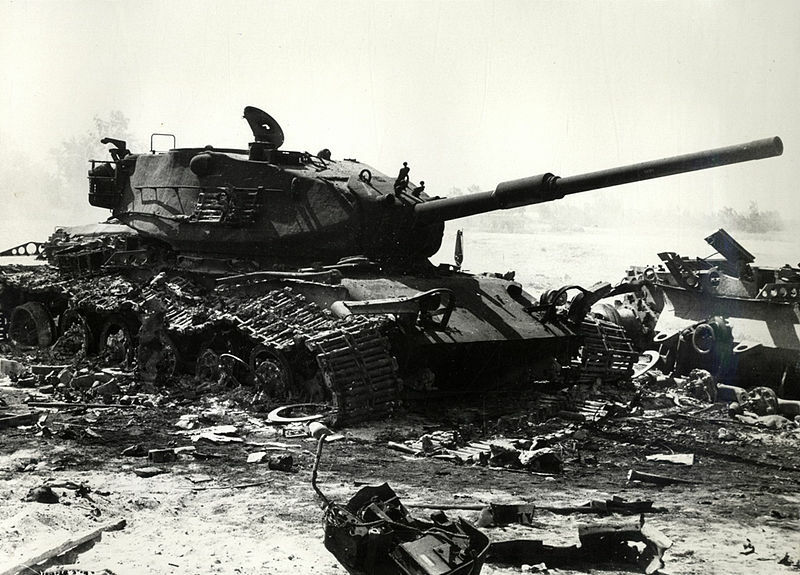 “Destroyed Israeli Tank” from Wiki Commons. Image is in public domain as a work of the Egyptian government. 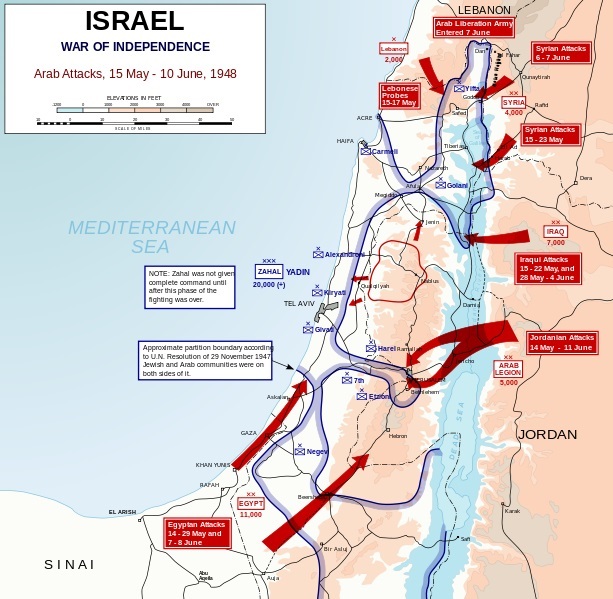 “Israel 1948 War map” from Wiki Commons. Image released into public domain by Mr. Edward J. Krasnoborski and Mr. Frank Martini, Department of History, U.S. Military Academy. Map authors do not necessarily agree with or endorse the views expressed by the author. (5) So, Who Did Discover America?